Itanagar- PM Modi will be visiting Itanagar today. He will reach IG Park, Itanagar by 10 am. He will lay the foundation stone for Greenfield Airport and will also unveil several other development projects. 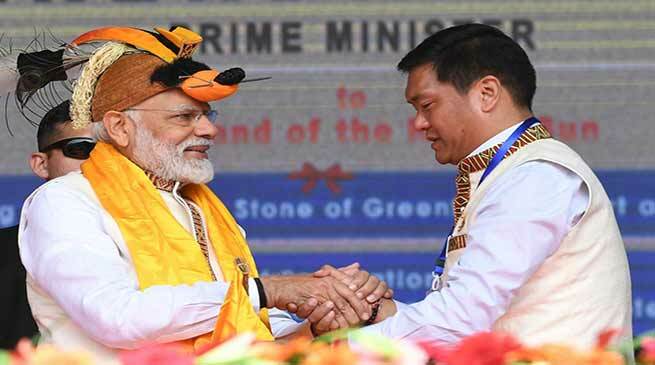 PM Modi has laid the foundation stone for a greenfield airport, the Hollongi Airport at Arunachal Pradesh’s Itanagar. “Today I got the opportunity to inaugurate or lay foundation of projects worth Rs. 4,000 crore. Additional projects worth Rs. 13,000 crore is in progress in the state,” said PM Narendra Modi. PM will lay the foundation stone for the construction of Greenfield Airport at Hollongi. PM will also dedicate 110 MW Pare Hydroelectric Plant in Arunachal Pradesh to the nation. PM will inaugurate the upgraded Tezu Airport in Arunachal Pradesh. 50 health and wellness centers in Arunachal Pradesh will be inaugurated by PM . PM will also declare 100% household electrification in Arunachal Pradesh under Saubhagya Scheme.